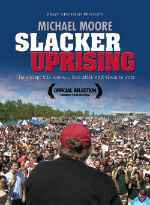 Michael Moore’s new film about the run up to the 2004 US election was released online today, only for US and Canada residents. In order to maximize capacity, they’ve even embraced BitTorrent, and the official download is using the Pirate Bay tracker. To the dismay of their lawyers, however, this also lifts the geographical restrictions. The film, intended by Moore ‘to bring out millions of young and new voters on November 4th.’, covers his tour just prior to the 2004 US Presidential election, rallying to protest against President Bush. It covers a 42 day tour, over 60+ cities, and the obstacles put in place by Republicans. To some this might not seem like a worthy event for TorrentFreak to cover, after all, films come out every week. However, this film markets itself as ‘…the first time ever that a major feature-length film is debuting as a free download on the Internet – legally.’ – a title that could arguably fall to Steal This Film. Yet, its the interaction between the legal and technical aspects that are the biggest story here. First and foremost, the film’s website states that downloads are available in the US and Canada only. It states this not just once, but twice AND uses an IP lookup system to check. If you fail the IP check, you are told that the lawyers have said the film can only be offered to people in those countries. It’s such a ’shame’ then, that they have used BitTorrent. Worse, they’ve used a set of public trackers (including The Pirate Bay), and allowed the use of both Peer Exchange and DHT. Clearly, all it needs is for someone to offer the .torrent to other people, and they can download the film, as the torrent protocol has no methods for limiting by geographical location. Indeed, as you can see on this screenshot, there are plenty of people on the torrent from outside North America. Is this deliberate, or accidental? Moore is known for his disregard of rules (and laws) in making films (such as his Cuba trip for Sicko), and this could be the latest example. Alternatively, it could be a lack of understanding on the part of those that are providing the technical backend. However, with a budget of $2 million for distribution, Brave New Films could have done better, and have set up their own tracker, enforcing a US and Canada only download. Not that this would have helped much. It’s the Internet, and once it’s downloaded, it can be retorrented. In that they might be foresighted enough to try and keep the downloads together, strengthening the swarm. Be the first to comment on "Slacker Uprising’s Torrent Available Worldwide, by Accident"